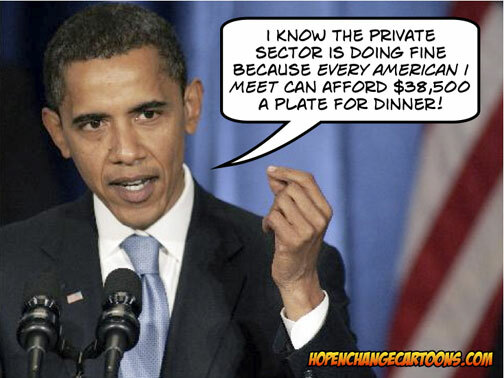 Barack Obama infamously observed that “the private sector is doing fine” almost a week ago, but like a piece of road kill ripening in the sun, the statement is emitting more of a stench with each passing day. For starters, let’s make it very clear that Obama’s words were not “taken out of context” as the Libs would have people believe. In Obama’s so-called “economic statement,” he cited anemic job growth in the private sector (which he magically took credit for) as the reason “the private sector is doing fine” before declaring that what this country really needs is another hiring binge of government bureaucrats who produce nothing but red tape and grief. But it’s the unending stream of bad economic news which really shows the callousness – if not downright insanity – of Obama’s declaration. Jobs in the private sector are down – way down. In fact, there are currently 4.6 million fewer people working than when Obama started “helping” the economy. Although happily for those people who are paid (and very well paid) with our tax dollars, Federal employment has skyrocketed up 11.4% since 2008. Then the Federal Reserve issued a report saying that since Obama’s election, the median net worth of families has dropped by nearly 40%. Hey, the president promised “change” – right? But to Barack Obama, all of this really is “fine.” Because each devastating blow to the private sector represents more people who are forced to put their hand out for government goodies. More people who will start to believe the propaganda that America’s problems come from the oppression of the evil rich rather than the intervention of the determined Marxists. And more people who are willing to trade away their votes and their freedom in return for promises which will evaporate – again – if Obama is granted a second, nightmarish term.